These cookies are a family favorite. Made fun for my son with lots of colorful sprinkles and safe for my hubby to eat because there is no wheat flour used. Simple one bowl drop cookies are my favorite to make too because they are easy and quick to make. 1. Preheat oven to 350°F and line a baking sheet with parchment paper. Pour sprinkles into a dish, set aside. 2. In a large bowl combine the sugars with oil and mix together thoroughly. 3. Add in the milk, tapioca flour, and extract and mix until completely combined. 4. Next add in the flour, salt, and baking soda. Stir together until just combined, then fold in the chocolate chips. 5. 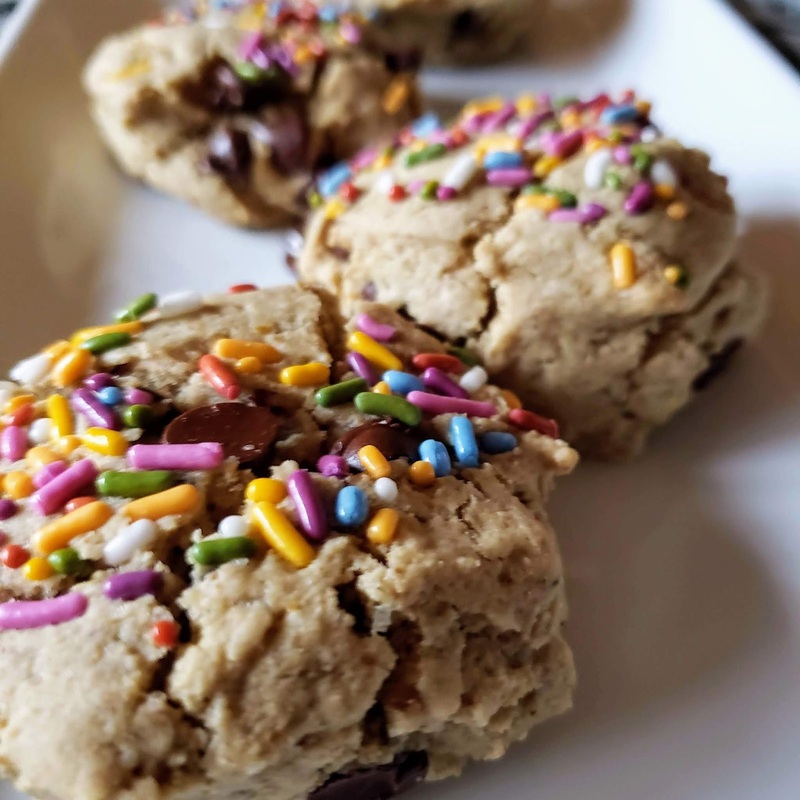 Using a large cookie scoop, scoop out balls of dough and press one side into the sprinkles. 6. Place cookie dough balls sprinkle side up onto lined baking sheet spaced evenly apart, 6 to a tray, and bake for 12-14 minutes. 7. Allow to cool on a rack and enjoy!